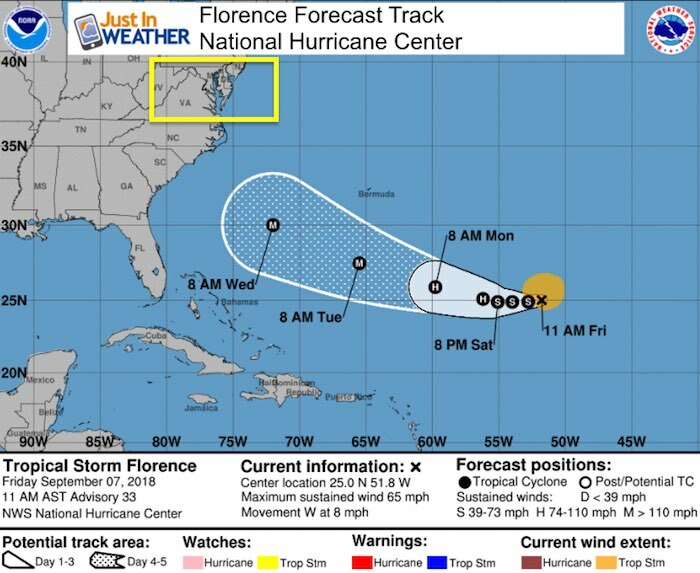 Florence quickly grew into a major hurricane at Category 3 and then back down to Tropical Storm status this week. It is expected to regain strength and possibly rival that major hurricane intensity again. The problem is that is when it will be a lot closer to the US east coast. The other problem is that is 5 to 7 days away and as much as computer modeling has improved, that is still a lot of time for adjustment. 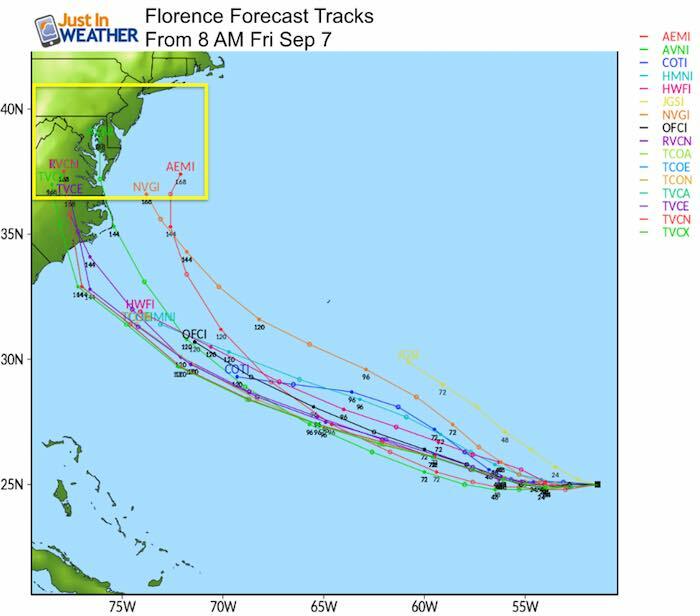 Yes, the morning model package showed a suite of solutions now taking Florence into the North Carolina coastline, when just last night it was stalling and looping off of the coast. That is what I showed in my morning forecast. The day before, it looked like a close blow but more likely a hit or impact on New England. Notes: While similar in intensity, the plot 126 hours away shows a distinct difference in proximity. The GFS model is much closer to the US indicating a faster storm. 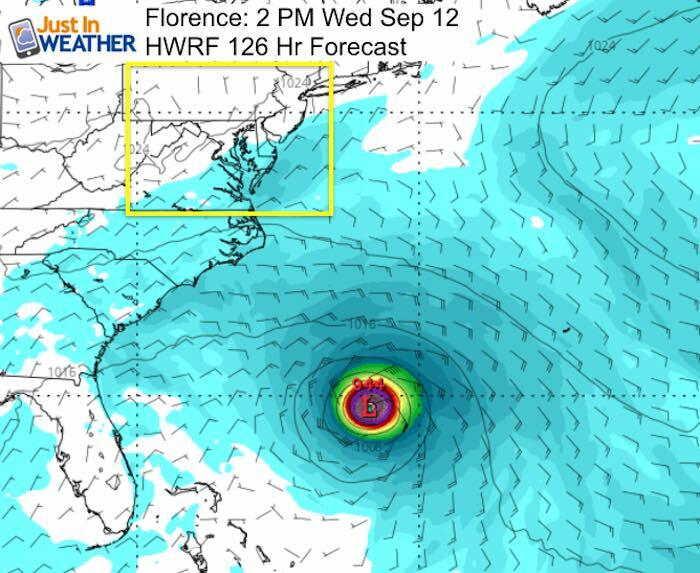 But if the HWRF model is correct, then by the time Florence gets closer to the US, High Pressure from Great Lakes could block and protect the coast. 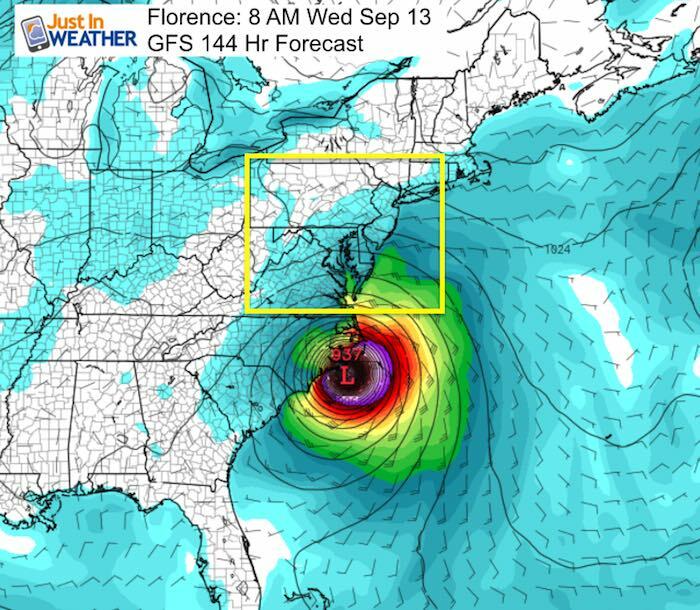 The GFS Plot (animation below) showed landfall in North Carolina next Wednesday morning. This is faster than prior runs… which items lends to possible error. I saw one online post in metro NY yesterday saying ‘experts watching for direct hit on New York’. 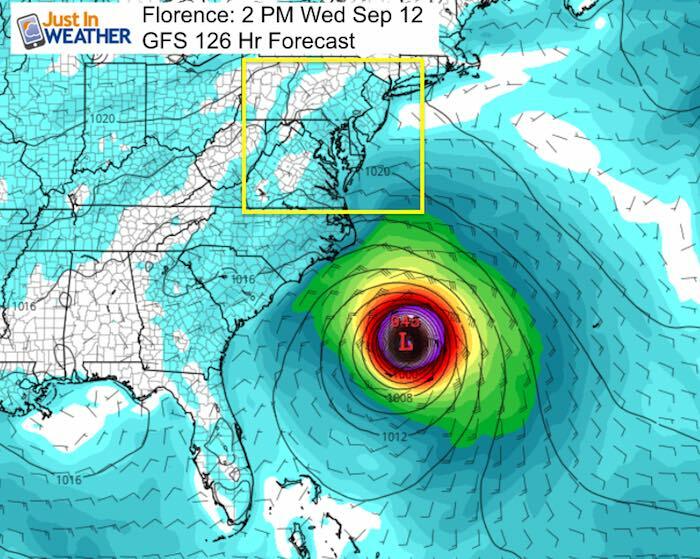 I don’t know who those experts are, but anyone with a degree in meteorology in the known scientific community is not better than computer modeling a week away. If they are, they should step up and get ready to become very wealthy. Much like tracking snow for a winter storm, we can watch the models more than a week away and almost always they will wobble and shift as new information comes in. 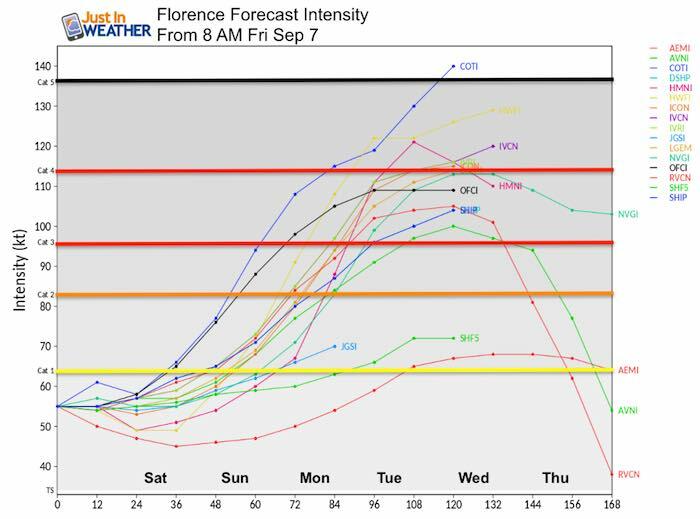 This can be a short of an upper level ridge, faster moving cold front, or even a storm that gets stronger than expected like Florence already did this week. There are so many more factors that play a role in where this goes, that I would NOT bank on what we see now, but rather wait until there is some consistency for three model runs in a row. I have not seen that, which is why I am showing this animation here. It not only plots the GFS Model landfall and then crossing over the mid Atlantic, but is followed by another tropical feature from the Gulf Coast through our region the following weekend. The name is based on what you see… a bunch of strong lines. These represent various computer model solutions that all use a variety of different influencing factors to plot the suggested path and intensity. Notice how wide spread they are farther out in time since we can NOT possibly know all of the factors than can shift and plump up this storm. 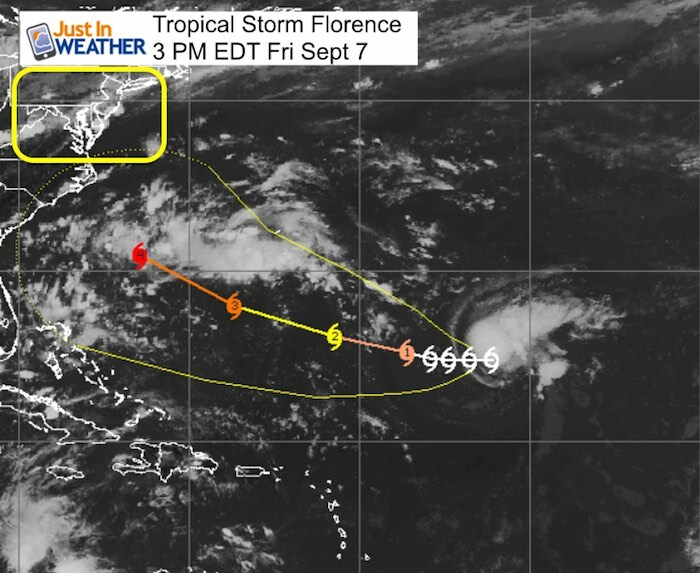 This wide variety of solutions spreading our farther in time is why The National Hurricane Center only displays their forecast track out to 5 days. Beyond that time frame there is too much that can change and we do not have the mathematical expertise to calculated that accurately with confidence at this time.